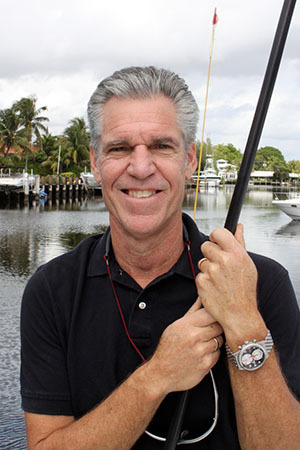 Phillip Berman is the president of 5 Oceans Marine Group and a lifetime yacht sailor and racer. He grew up racing boats in California in the late 1960’s and published his first book on boat racing at the age of seventeen. Called MULTIHULL RACING THE HOBIE CATS, it was published by Sea Publications, NY in 1975. He went on to write many more books on the subject including the best-selling catamaran training manual of all time, CATAMARAN SAILING FROM START TO FINISH (W. W. Norton, NY, 1982.). He also wrote CATAMARAN RACING FROM START TO FINISH (W.W. Norton, NY, 1984), WINNING IN CATAMARANS (Wind Publications, 1979), PERFORMANCE WINDSURFING (with Mike Waltz, W.W. Norton, 1984), as well as the Hobie 14 and Hobie 18 Performance Manuals (Murray’s Marine, 1984). He has been a regular contributor of articles over the years to Sail Magazine, Cruising World, and a wide range of yachting publications around the world. While a graduate student at Harvard, where he took his master’s degree in the History of Religion, he represented the U.S. in numerous international sailing races and was the Hobie Cat World Champion in 1979 and 1980. In addition to racing small boats, he has raced and cruised much larger yachtsin the Philippines, Thailand, French Polynesia, up and down the Caribbean, the Mediterranean Sea and the Swedish and Finnish Archipelagos. He has also sailed extensively up and down the Eastern Seaboard, throughout the Bahamas, Brazil, Mexico, Australia and Singapore. In 2011 Phil formed Balance Catamarans to co-design and fabricate his own line of boutique, high-end, semi-custom performance voyaging yachts. What many 5 Oceans customers don’t know is that for many years Phil wrote several books on philosophy including THE COURAGE OF CONVICTION (Ballantine, 1986) which was nominated for the Kennedy Book Award and THE SEARCH FOR MEANING (Ballantine, 1990) which was nominated for the Pulitzer Prize in non-fiction. Most recently, he co-wrote The New York Times Bestseller, REASON FOR HOPE (Warner Books, 1999), with Dr. Jane Goodall. He spent time with Dr. Goodall in Tanzania and from that experience co-produced a widely acclaimed PBS documentary. He has lectured extensively throughout America on the topics of belief and values. He has appeared on the Today Show, CNN, the Oprah Winfrey Show, and numerous news broadcasts among others. Phil’s interest in beliefs and values has been a lifelong passion and has colored his entire approach to the development of his business model at 5 Oceans Marine Group. Phil is married to Anne Gordon, Senior Vice President of Marketing, Media and Communications for the Philadelphia Eagles Football Team. They have a twenty-six year old son, Aaron. Our experience in working with 5 Oceans, with Phil Berman as our broker was outstanding. Phil and his team could not have been more attentive and helpful. We appreciate the considerable amount of time they spent educating and guiding us through the entire process. If we need brokerage service down the road, we will return to 5 Oceans without hesitation. In closing, the one thing I must say is this: You want someone like Phil and his staff on YOUR side. Phil is a hard-nosed negotiator and gets things done right! From finding us a boat, helping us as sea trial, all the way to the closing, the entire staff at 5 Oceans Marine Group was joy to work with. They treat you like family.